To collect all your scientific production, gathering the different publications that present variants of your name. To unify your signature as a researcher, with the chosen form (you should use the FECYT guidelines). It mahes it easier to collect the citations received and to calculate the H index. To give greater visibility and diffusion to your scientific production. It allows a free registration to generate a unique identifier code. It facilitates searches and the creation of curricular profiles.. It provides bibliometric data such as the H index and the citations received in WOS. 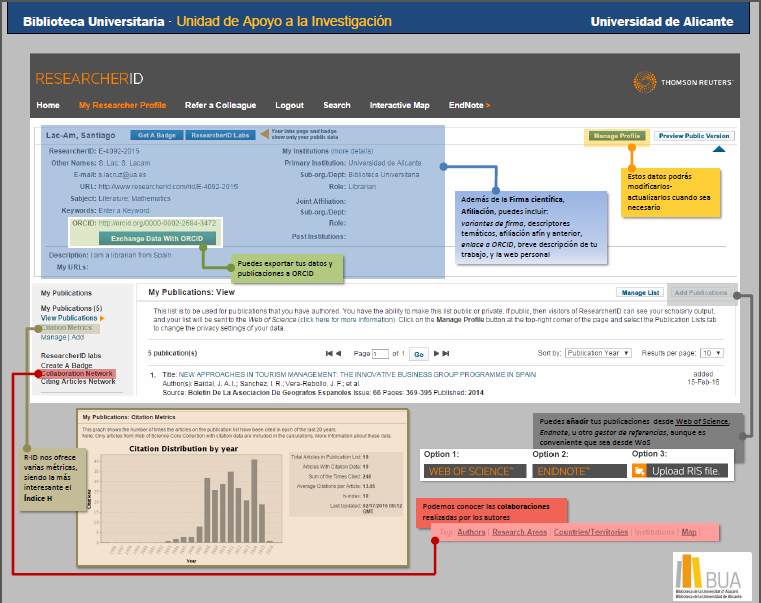 Scopus author ID: author and profile identifier, integrated in the database Scopus (Elsevier). It is automatically created for any author whose work is included in this resource. It is common to find several authority entries for the same researcher, altering the surnames (mainly the spanish ones). It offers metric analysis, h index and citations monitoring. A unique and persistent identifier for scientific and academic authors, which contains the scientific signature and eliminates the ambiguity between their research and this of any other researchers with the same or similar name. A space to register their data and works, and to share them if you wish. It is expressed as a unique URL (ex. http://orcid.org/0000-0000-0000-0000). This initiative, created and maintained by an association of academic entities, is supported by the main international editors (Nature Publishing Group, Elsevier, Hindawi, Thomson Reuters, Springer, Wiley...) and research institutions (CERN, MIT, CalTech...). Although its voluntary nature, this identifier is already being requested in the presentation of the abbreviated curriculum for the Ministry of Economy and Competitiveness I + D + i Projects. In the future, it is expected that it will be increasingly demanded by R & D organizations, journals and evaluators. In spite of the institutions where researchers may develop their scientific activity throughout their life, the ORCID code will always remain the same, what allows to create automated links between all thei professional activities. 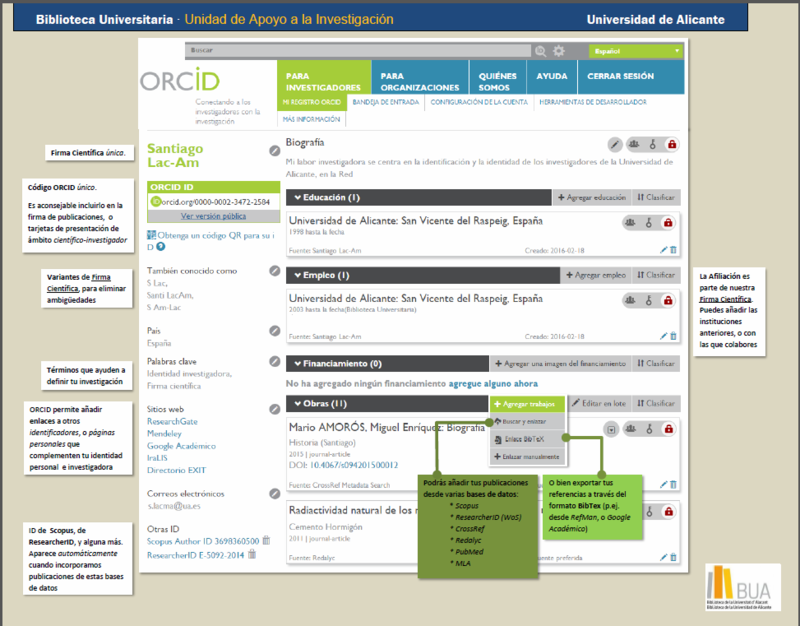 Researchers can register individually in ORCID for free. Disambiguation of names: avoids the confusion between his name and that of their colleagues with similar or equal names, allowing to create the unique scientific signature and name variants.. It allows a correct attribution of publications in multiple sources and information systems. Option of signing articles with the ORCID code (when accepted by the main scientific publications). Simplification of the research activity evaluationn tasks. Integration in scientific production management systems (repositories, Universitas XXI,…). Possibility of associating the ORCID with the funding requests and the CVN standard of the FECYT. Google Scholar Citations: Google Scholar application to create a professional profile in the academic field. It allows to collect the scientific documents located from Google Scholar. Journal articles, books and chapters, communications and conference papers, scientific-technical reports, theses, dissertations, grade reports, and other works collected in institutional repositories. or with references in academic or research websites (universities, research centers), publishers, repositories, library catalogs, databases (eg Dialnet), etc..
Presents H Index and monitorization of the citations located in this database. Collecting documents in several languages, in addition to English. Very suitable for Social and Legal Sciences, Humanities, and even Engineering, since its production does not only focus on journal articles. 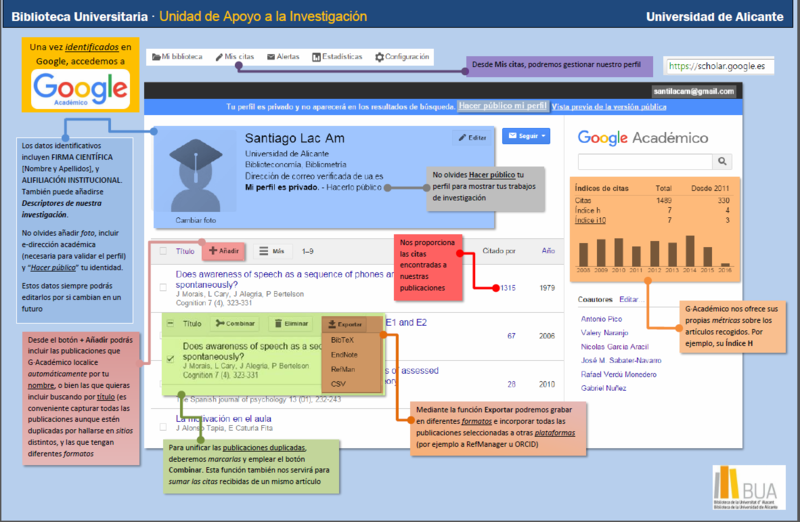 How to create your researcher profile in Google Scholar Citations (Alonso Arévalo, Universidad de Salamanca). Dialnetis a database managed by the Dialnet Foundation and maintained by many of the Spanish universities, including the University of Alicante. The creation of the researcher profile in Dialnet is subject to the inclusion of any publication in it. The maintenance and updating of the data can be requested to the database itself or to the Research Support Unit: apoyoinves@ua.es. Scientific publications (articles, books and chapters, conference proceedings, reviews, etc.) of mainly Spanish production and in spanish language, although it also includes some international ones. References not located in other commercial databases and some of them in full text. It is a good search engine for Social Sciences, Law and Humanities publications. For the rest of disciplines, it is useful to locate publications of "teaching research" and even theses. Allows you to link with other profiles as ScopusID, ResearcherID, ORCID, ISNI, Google Scholar, MathSci, etc. Signature variants can be included to eliminate ambiguities. Gives visibility to institutional production.